From late February to mid March the Adelaide Fringe was on. I paid to see one Fringe show – Die Roten Punkte which was a really enjoyable show. It had humour and music – both really well done. They’re playing at the Melbourne Comedy Festival which is on now so if you’re in Melbourne I’d recommend seeing them. So what was I doing for the rest of the Fringe? 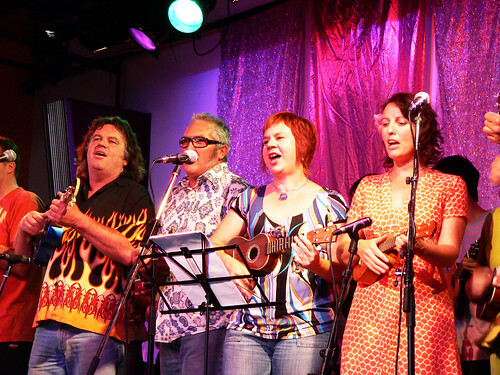 Well, I was actually participating myself as part of other shows in our local ukulele squad. I kept it pretty quiet in these parts. Let me say it was a hoot to do and I look forward to doing more as time goes on. See more pics of us here. Wow – well done, girl! What a hoot. You are famous Jen.